When a substance enters the body, the body tends to wrap this substance and tries to push it away. If you have a fish bone stuck on your body, it does not belong there, therefore the body wants to remove it by wrapping it around with something and pushing it away. The same applies to the silicone implant. This is exterior substance to the body, therefore the body wants to separate itself from the implant. The body wraps the implant with a barricade. This barricade is called a capsule and this whole is called capsular contracture. Capsule being formed is a natural happening if you use implant for breast augmentation. But if this capsule is rather thick and somewhat abnormal, we call is capsular contracture. 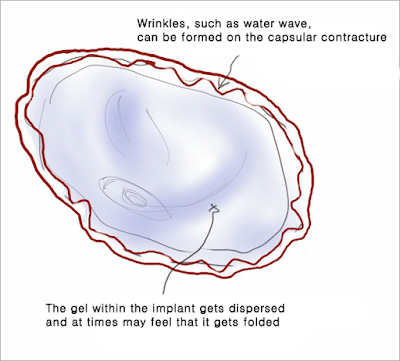 If the capsular contracture is severe and pressures the implant from all parts, it becomes round shaped like a football. This can be visible from the outside. The round shape is the reason why we call this a “capsular contracture”. Such details are known by the patients but this is the only information that they know. Capsular contracture is high stage of epidemic contracture. Also, contracture does not always come in round shape, even so with the high staged capsular contracture. This capsular contracture not only happens in the breasts but also in the other parts of the body where we use outer substance therefore this is some burdening side effect that we are concerned with. Do I need a correction surgery if I have capsular contracture? There are different types of capsular contracture. This differentiation was made abroad. The symptom of the capsular contracture can be known by the doctor but not by the patient. The patient can feel the symptom of the capsular contracture more so that the doctor. This is the differentiation, but there is not much importance to it. The patients who get breast augmentation at our country are different from those in US. Korean patients have thinner layer of skin. The ratio of the implant is larger than that of the breast skin, therefore if the breast feels tight and strong, the patients misjudge it for capsular contracture. What I am trying to share is that such academical differentiation in the type of capsular contracture is not important. This is the differentiation that I have come up with. 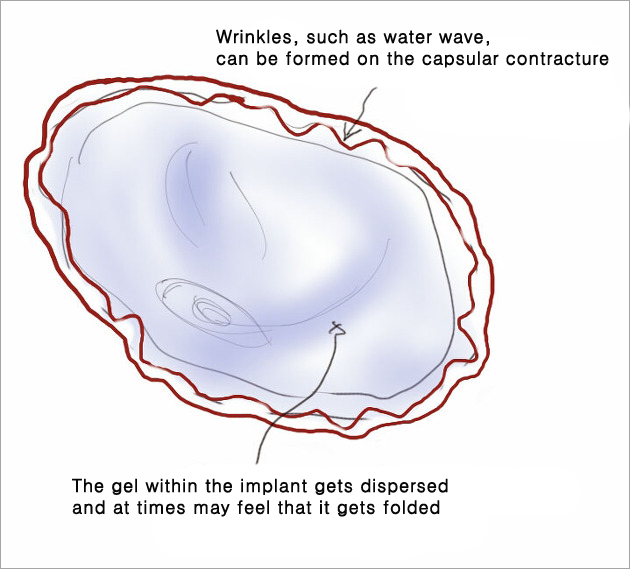 If the fibrous capsule feel thick, when we follow-up patients after the surgery we push on the surface of the breast. (Push is rather a more correct term than feel) If you push on the breast, it moves about easily here and there. The fibrous capsule is formed by our body therefore there is some form of mobility. If there is no mobility, we call this “fixed”. But let’s say that the capsule is very thick and feel that it is hard when pushing it. We call this status “firm”. Let’s say that your breast feel as hard as a rock, then we call this “hard”. The breast can move about as you push on it, but it should not move about too easily. The differentiation that I made by pushing on the breast is subjective but it is something that I use to explain on the status. We do not need to do a correction until the “fixed” status. But correction surgery is necessary as the status moves closed to “hard”. There are many ways to do the correction surgery. We can consider the incision spot of the original surgery and then apply various methods. The most simple method is opening up the capsular contracture. By opening up the capsular contracture, we would provide more room for the implant so that it can breath better. If we applied inframammary fold incision in the original surgery, it is really easy to open up the contracture at the bottom part. If we applied axillary fold incision, it is easier to open up the upper part of the contracture. It is really difficult to open up the bottom part in this case. We need to remove the implant prior to opening up the bottom part of the capsular contracture. This means that we also need to change the implant. We can apply local anesthesia for opening up contracture from the inframammary fold. But if the incision was done on the areola or the axillary, then general anesthetia might be necessary because the patient might suffer from the pain. Another correction method is the removal of the capsular contracture. Opening up the contracture would not be enough for high staged capsular contracture because the implant would not have much mobility. In this case, we need to actually remove the capsular contracture. We need to remove the contracture from the muscle, however, the pectoralis muscle is tightly stuck to the capsular contracture. It is really difficult to separate the two. It is even more difficult to separate upper pectoralis muscle from the capsular contracture. We might have to remove some skin as well. In doing so, we can solve the capsular contracture problem, but there is a possibility of making the breast contour wrinkly. Removing your fat makes the body wrinkly and this cannot be solved. Therefore, if we much remove the capsular contracture, we tend to remove part of it rather than the whole. Let’s say that you have the most severe case of capsular contracture. In this case, it is best to input the implant on a different plane. If you applied dual plane in the first surgery, we could remove the implant and place it above the pectoralis muscle. This is one way of solving capsular contracture. The doctor must consider the status of the patient and judge on which method to use. The trust between the doctor and the patient is really important. If the patient suffers from capsular contracture, she might want to blame the doctor and think why this has happened to her. But the important facts are that capsular contracture is not something that you cannot take care ot. Also, second is that the communication between the doctor and the patient is very important. There must be high level of trust between the doctor and the patient so that the doctor can derive the best result possible without having to be much concerned about the patient’s emotional status. There needs to be proper and careful planning in order to conduct a successful correction surgery. There are cases where the capsular contracture occurs again although you have done a correction surgery to remove it. There are some patients who suffer from repetitive cases of capsular contracture over and over again. This is really rare, but one must come to a conclusion that the silicone implant is not fitting for her. If you have much fat, then fat transplant would be recommended rather than the usage of the implant but fat transplant is not a one time thing. It must be done multiple times to get the best possible result. However, the patients here in Korea are very thin. If you have much fat on some part of the body, it would be less likely for you to have small sized breasts. Anyway, polyurethane implant would be recommended for such patients. I will share more information on this in the future, but polyurethane would be a necessity for those patients who suffer capsular contracture over and over again. Korea approved the usage of polyurethane implants last year and therefore there is an another good substitute for our patients. Today, I have shared some details on capsular contracture. I hope you liked it. Thank you very much.